Mike McKinney is always up for a challenge. When the environmental studies program he developed became part of the Department of Earth and Planetary Sciences in 2011, he was on the lookout for a new venture and decided to write a proposal for an interdisciplinary sustainability program. In 2012, the Sustainability Program appeared in the undergraduate curriculum as an interdisciplinary program. The first year, nine students majored in sustainability. Today, the program has more than 40 majors and 15 minors and is one of the larger interdisciplinary programs in the college. “One challenge for this major is that it’s kind of about everything,” McKinney says. Courses within the major focus on two main areas: social sciences and natural sciences. Students take courses in environmental ethics, sociology, and economics, as well as courses on resource management, urban ecology, and other global science issues. Another challenge McKinney faced with this program was how to define sustainability. 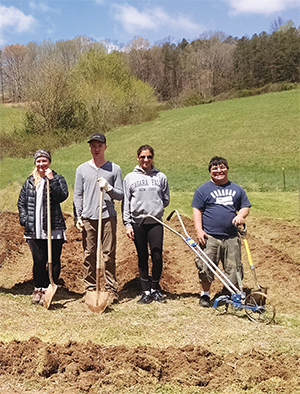 McKinney’s holistic approach to sustainability provides students with plenty of opportunities to explore different applications of a sustainability degree through service learning projects in the Knoxville area with organizations like Beardsley Community Farm or the city of Knoxville Office of Sustainability. Before they graduate, each student is required to complete an internship in energy or sustainable agriculture or with another organization where they learn first-hand the role sustainability plays in the world. One of those students was Candice Lawton, who graduated with a degree in sustainability in December of 2015 and began her career as a brand partnership associate for TerraCycle in February of 2016. Lawton originally majored in chemistry, but her experiences with the Project Veggie Community Garden on campus exposed her to environmental issues, sustainability, and the challenges facing society. “I began to look into the types of environmental programs offered at UT and found out about the Sustainability Program,” says Lawton, who was one of the first students to major in sustainability. Because the program was so new when Lawton declared her major, a lot of people questioned why she chose it and if she would have a job after graduation; including her parents. Lawton encourages any student interested in economics, sociology, or environmental science to give the Sustainability Program a try for at least one semester.